Filming this documentary about his father made Ryan realized the pumpkin doesn't stray far from the vine. It turns out Ryan's father approaches gardening much like Ryan approaches filmmaking. They are both obsessive and meticulous about every technical detail and they pride themselves on good planning, innovation and experimentation. And in the end, they receive joy not just from the final product but from the process and the educational experience as well. Complimenting Ryan the engineer, is Bill (not the grower, a different Bill) the architect and, like an architect, bill looks at filmmaking as a combination of art and science. 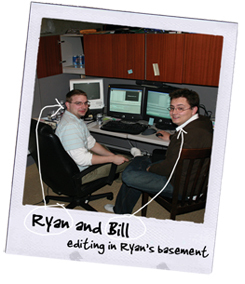 When Ryan would get bogged down by a small detail Bill would try to bring back the larger picture, and when Bill would present a broad idea or concept Ryan would present the know-how to get it done. If you'd like to be an investor, would like to donate (cash, equipment, ideas) in this film, contact us for details..